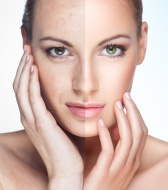 A chemical peel is a treatment technique used to improve and smooth the facial and/or body skin’s texture using a chemical solution that causes the dead skin to slough off and eventually peel off. The regenerated skin is usually smoother and less wrinkled than the old skin. There are a variety of chemical peels, all able to achieve varying results dependent on what the skin needs. A light peel is mild and effective in exfoliating and rejuvenating the appearance of skin temporarily, while deep peels are capable of resurfacing the texture and appearance dramatically. Reactions to chemical peels are similar to sunburn in that the deeper the peel, the longer the recovery period. Post-procedure ‘downtime’ averages a few days to two weeks. Post-procedure care is required for all chemical peels in that the treated area must be continually hydrated and moist and a topical broad-spectrum sunscreen will be necessary to protect the new skin from sun exposure. Our providers at Shu Cosmetic Surgery Medspa are trained and experienced the various chemical peels we have to offer and will discuss your desires and concerns and aid in selecting the appropriate peel at the time of treatment. The Vitalize peel from SkinMedica is our lightest for all skin types. It is a very superficial peel that causes mild to moderate peeling for 2-3 days with no downtime. Vitalize is indicated for mild to moderate skin conditions such as acne, acne scarring, melasma, and sun damage (photoaging). This peel can also be bumped up in strength with a layer of retinoic acid. A series of 6 is recommended for best results and can be repeated every 3-4 weeks. We also offer another superficial peel that penetrates the entire epidermis and goes a deeper than our Vitalize peel. This peel is also for any skin types and is more effective for treatment of actinic keratoses, sunspots (brown spots), and epidermal growth such as thin seborrheic keratoses. Skin texture may also be improved. Redness and scaling will occur for up to 1 week post-procedure. This is one of the medium-depth peels we offer and is most appropriate for patients with moderate to advanced photodamage and wrinkles, and those with actinic keratoses, superficial skin growths, and pigmented scarring. Swelling usually occurs in the first 1-3 days post-procedure and peeling may occur for 7-10 days. During the following 3 months after the peel, there is an increased collagen production for improvement in texture and smoothness. Our deepest peel is a combination of Jessner’s solution and 35% TCA (Monheit combination), which is the most popular of the medium-depth peel. This peel is particularly useful for the improvement of moderate to severe photoaging and wrinkles. It freshens any sallow atrophic skin and softens fine lines, with minimal risk of complications. Collagen remodeling of the skin occurs for as long as 3 to 4 months post-procedure. This chemical peel is also effective in combination with resurfacing laser treatments that were done in localized areas or areas of scars, to help blend and even the surrounding areas of skin.